How blessed are those who are saved by the cross of our Lord Jesus, for they have obtained a godly power to overcome Satan and sin. For them natural death has become a transition from a miserable, transitory life to a glorious, eternal life. How miserable are those who are perishing for they do not know the holy sacraments, they have lost their power, and the sacraments have become nonexistent to them. Didn’t the writer of the Psalms speak about people like them, “Fools say in their hearts, There is no God. They are corrupt, they do abominable deeds; there is no one who does good” (Psalm 14:1). For the one who wallows in a pit of corruption and sin and does not comprehend the heavenly lessons is considered foolish because he has disregarded God, just as the idolaters were far away from the true God, worshiping the created and not the Creator. They are ignorant of the power of the cross, for they do not believe in God’s plan of salvation for humanity, they do not understand the secret of the work of redemption, they do not believe in the beloved Redeemer. And, concerning the Jews “if they had understood they would not have crucified the Lord of glory ” (I Corinthians 2:8). For to those who were entrusted to keep the prophets, the law and the law codes, the cross became a stumbling block because they didn’t want to study the prophets to understand the secret of redemption. Therefore, they lost the power of the cross which is called the power of God by Saint Paul. The cross derives its power from the merit of Christ’s death on it and His resurrection from the dead which announced the Father’s acceptance of the atonement of the crucified One and His redemption of humanity. As the apostle Peter expressed to the chief priests of the Jews about the Lord Jesus, “The God of our ancestors raised up Jesus, whom you had killed by hanging him on a tree. God exalted him at his right hand as Leader and Savior that He might give repentance to Israel and forgiveness of sins” (Acts 5:30,31). For millions of people were crucified before Christ was crucified and after, but not one of them was raised from the dead but their names were wiped out and their souls went away and they left nothing but a memory behind. But only the Lord Jesus, who was crucified and died on the cross and was buried in a new tomb and rose from the dead on the third day, has raised us with Him and has seated us with Him in heaven. Since He was crucified for our sake and redeemed us from the curse of the law He became a curse for us as it is written, “Cursed is anyone who hangs on a tree” (Galatians 3:13 and Deuteronomy 21:23). So, Christ exchanged the curse of the cross for a spring of heavenly blessings and spiritual graces and the cross has become the banner of the Christian church, its symbol and the subject of its boasting. After it was a sign of weakness and humiliation it became a sign of the power of God and the glory of His church. This godly power is taken by everyone who believes to obtain salvation by the blood of Jesus Christ that was shed on the cross; that the blood of Christ is truly synonymous with the cross for it is the blood of the incarnate God, as the apostle Paul says to the priests of Ephesus: “Keep watch over yourselves and over all the flock of which the Holy Spirit has made you overseers, to shepherd the church of God that he obtained with his own blood” (Acts 20:28). Preached during the liturgy on the commemoration of the 11th anniversary of His Holiness’s enthronement. Translated together with Anwar Mosa Matta. The cross is also analogous to the whole gospel as the apostle Paul said to the Corinthians; “For I decided to know nothing among you except Jesus Christ and him crucified” (I Corinthians 2:2). For there is no gospel of salvation without Christ’s crucifixion on the cross and resurrection from the dead. Christ through the cross gave us the sacrament of reconciliation with his heavenly Father. He also gave us the two graces of justification and sanctification, besides the grace of adoption, making us eligible to stand before the heavenly Father not as slaves but as children by grace to call to Him with the boldness of children saying; “Our Father who is in heaven.” He has given birth to us from above not from the will of the flesh or the will of a man but of God (John 1:13): for the cross with all of its merit made us heirs to the kingdom of heaven, for the power of the cross is the reconciliation of heaven with earth. The earth obtains life from heaven after believing in the Lord of heaven and earth and accepting his plan for salvation. This power is the victory over Satan so that whoever draws the sign of the cross on his forehead with faith terrorizes Satan and demons all together run away from a young Christian child who draws the sign of the cross. For, the crucified Holy One gives one spiritual power to become a spiritual champion and a little Christ. The child deserves the victory that Christ gives us by grace through his victory over Satan by vanquishing him on the cross and by giving us the cross as a sharp spiritual weapon. This godly power hidden in the holy cross was the origin of inspiration for the apostle Paul to announce before the people saying: “May I never boast of anything except the cross of our Lord Jesus Christ by which the world has been crucified to me, and I to the world” (Galatians 6:14), “and it is no longer I who live, but it is Christ who lives in me. And the life I now live in the flesh I live by faith in the Son of God, who loved me and gave himself for me” (Galatians 2:20). Yes, faith in the crucified Jesus, the redeemer of humanity, requires of believers both death and life, which is the complete sharing with Christ in his passion and death on the cross so that believers die to the world and their sin. Also required is life through Jesus who rose from the dead: a life that is spiritual resurrection in unity with Christ who said: “I am the resurrection and the life. Those who believe in me, even though they die, will live, and everyone who lives and believes in me will never die” (John 11:25-26). So, as the apostle Paul crucified himself with Christ, he gained life in Christ and discovered the secret power of the cross of Christ. Previously the cross had been a stumbling block to him and a hindrance to faith in Christ the Savior, it then became a smooth path for him to Christ. Moreover it became for him life and boasting (Galatians 6:14). Yes, the knowledge of Jesus Christ crucified truly is a revelation of the two sacraments of incarnation and redemption. It is also a confession that Christ has truly taken on our flesh and was tempted like us in everything except that he did not sin though he died in the flesh on the cross atoning for our sins. Therefore when we make the sign of the cross on our faces we say, “In the name of the Father, the Son, and the Holy Spirit, one God, Amen” and we proclaim our faith in the sacrament of the Holy Trinity of the one God and the equality of the three persons of the Trinity in essence as we confess in the two sacraments of the incarnation and redemption and the work of atonement on the cross. Therefore, Christians have taken the cross as their symbol from the beginning of Christianity and they know it as the banner of the Church. >From this sound Christian understanding the Christian Queen Helena, mother of the Emperor Constantine in the fourth century A.D., pledged to search for the cross if her son the Emperor Constantine came to believe in Jesus Christ as the redeemer of humanity. She prayed continuously day and night, accompanying it with fasting, and gave alms so that the Lord would answer her plea. God willed that and showed Constantine the sign of the cross in the sky in the middle of the day and with it wrote the saying, “In this sign you will conquer.” So Constantine took the sign of the cross as a banner for his army and conquered his enemies. He became Christian and his mother fulfilled her pledge in the year 326 A.D. and went to the Holy City, searched for the cross and found it. She was assured by a miracle that it was the real cross that the Lord Jesus hung on at Golgotha when the cross was placed on the body of a dead young man, immediately when it touched the body life returned to that young man and he was resurrected and the bishop of the city blessed the people with the holy cross of Christ. Truly the Christian church venerates the holy cross as it also venerates the sign of the cross, just as citizens honor the flag of their country, in this way they honor their nation and country. Whoever honors his country honors his flag which is a symbol of his dignity. We honor the cross worshiping the One who was crucified on it, died and rose from the dead triumphing over death, Satan and sin and through it he gave us victory over these three enemies. In the cross we see the sacrament of salvation just as the people of the Old Testament in the wilderness, where the tormenting deadly snakes bit them, lifted up their eyes in faith to see the copper snake suspended on the staff in the midst of the area to gain salvation from death. We the Syriac people do not put a statue of Jesus on the cross because He who died on the cross was taken down from the cross and buried in a new tomb and was gloriously resurrected on the third day. So, He is not on the cross any more. The cross is free of Him. As we honor the cross we worship the One who was crucified on it. We do not worship a statue and that’s no wonder as a result when the children of Israel worshiped the copper snake at the time of King Hezekiah, this faithful king destroyed that copper snake and threw it in the fire with the rest of the idols because it had become a reason for the perishing of the people after it had been a source of their salvation. So in our honoring of the sign of the holy cross, we however worship the Lord Jesus who was crucified for our sakes and for our salvation. We worship his cross because it is His and His holy church’s banner and through it all of her sacraments are made holy. We honor the wood of the cross because it touched the body of our Lord Jesus Christ, and his pure and precious blood was shed on it for the cloth that touched the body of Saint Paul had extraordinary heavenly power so that when it was placed on the sick they were healed. So how much more believable that the wood the Lord Jesus was crucified on and touched his holy body has conferred holy power to grant healing to souls of believers and their bodies?! The blessed church fathers say: “If the tree of life that was planted in the middle of paradise symbolized the wood that the Messiah was hung on, and if the first parents had been prevented from eating of its fruit after they sinned so as not to be granted eternal life in a state of sin, then their offspring would have had the right to eat the fruit of salvation that comes from the crucifixion of Christ on the wood after these offspring were granted redemption through the heavenly crucified One and the believers were made righteous through his atonement and they were made holy and are entitled to life forever in the crucified Christ. The wood of the cross and its sign symbolizes the blood of the Passover lamb that was smeared on the door posts and the lintel of the door of each house of the people of the old covenant in Egypt. And when the angel of death saw the blood of the Passover it did not destroy the first born of that house. So, the sign of the cross saved the first born of the people of the old order. Yes, my beloved: for we who are saved the word of the cross is the power of God and the sign of the cross is the sign of our holy Messiah who willed that this would be the sign for all who truly become his disciples, for He, glory be to Him, said: “Whoever does not carry the cross and follow me cannot be my disciple” (Luke 14:27). And he also said to the people and his disciples together: “If any want to become my followers, let them deny themselves and take up their cross and follow me. For those who want to save their life will lose it, and those who lose their life for my sake, and for the sake of the gospel, will save it” (Mark 8:34-35). For it is not possible to become disciples of the Messiah unless we first deny ourselves. Denying self means that the believer confesses his own weakness, the power of God Almighty and the need of the believer for God whose might is not equaled in the universe, Holy be His Name. But carrying the cross is the ultimate surrender, and the disciples of Christ have buried their selfishness with Christ so they no longer look out for themselves but for the salvation of others. The cross is a recognition of the right to salvation for perishing sinners from among our brothers in humanity for whose sake and for their salvation and our salvation Christ carried his cross and was hung on the cross. So the disciples of Christ should strive for the salvation of people to partake of redemption and to become children of God by this grace. Discipleship to our Lord Jesus Christ, self denial and carrying the holy cross: all these holy things remind us in these moments of the glorious historical day when we sat on the Apostolic See of Antioch by grace not by worthiness. And we today by the grace of God have placed our foot on the threshold of the 12th year of our Patriarchate. We begin this year as we began our service in the Patriarchate with sure faith and self denial and sacrifice by carrying the cross of our Lord Jesus Christ following his footsteps on the way to Golgotha with the patience, endurance and forbearance. Bearing the cross is a proof of our confession of its divine power and our confession of our weakness and the full reliance on him, to him be glory, for he is the one who says to us as he said to the apostle Paul: “My grace is sufficient for you for my power is made perfect in weakness” (2 Corinthians 12:9). By the grace of God on high we have been chosen for the service of his church and he called us to share in carrying the cross and seeking for the salvation of souls. And there is no doubt about that for we have seen him on the way to Golgotha exhausted from his sufferings; as he is walking his blood is dripping from his wounded body, the effect of the severe beatings and strong punches. After they had tortured him with wild whipping and when he did not seem able to bear the cross, Simon the Cyrene was conscripted to carry the cross instead of him. In this we learn that the Lord Jesus permits humanity to carry his cross, to carry with him responsibility for the salvation of humanity and sharing with him in the work of redeeming humanity. For the responsibility of salvation by the cross has been given to us by way of the holy church, the sacramental body of Christ, which was worthy to receive the merits of redemption by the cross and to preserve them as we guard our own eyes, and to distribute these merits to its children the believers that they would become disciples of Christ, its Lord and its bride and its head. God on High has prepared us since we were children to be a disciple of Christ as he prepared us to sit on the throne of Antioch by grace not by worthiness. 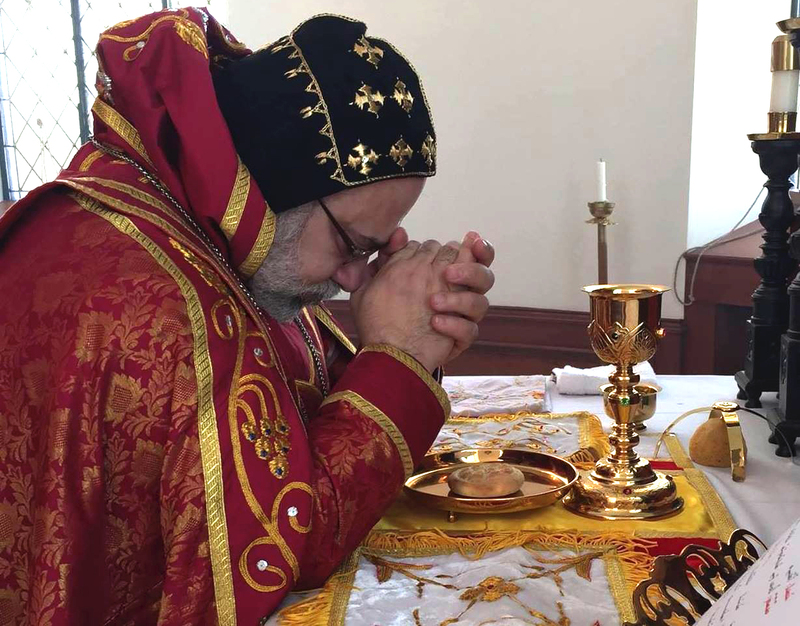 For that reason we raise to his majesty thanks for what he has granted us during these years, these past eleven years in which we have carried the burdens of the Patriarchate. Thanks to the members of the Holy Synod, the respected metropolitans who by godly inspiration elected us Patriarch to carry the banner before them in service to the church of God purchased for her by his blood to glorify his holy name for the salvation of the children of God. Also, Oh beloved, we thank the respected metropolitans participation with us in this prayer on this day. May God give them success in their apostolic service and may God be with us all in the coming days as he was with us in the past years for without Him (glory be to him) we are not able to do anything as he said in the holy gospel (John 15:5). We thank you all, clergy and people, asking God to bless you by his holy cross and preserve you and your children and prepare you for the day when the sign of the cross appears in the sky announcing the second coming of the Lord Jesus that you would be among the number of those marked by the cross, saved by the cross and gaining resurrection with the righteous (John 5:29), who will be in the day of judgment with the sheep on his right hearing his sweet voice saying to them, “Come, you that are blessed by my Father, inherit the kingdom prepared for you from the foundation of the world”; (Matthew 25:34) and inherit with him his heavenly kingdom: the position that I wish for me and for you. By His grace. Amen.